The division between categories 2 and 3 is similar to that with qin poetry and song, with qin poetry (poems that mention qin) corresponding to qin in art, and qin songs (lyrics that accompany qin melodies) corresponding to art which can be used to illustrate a specific qin melody. The qin is a very common motif in traditional landscapes, but the latter category is also quite considerable, and it is the latter which this website emphasizes. Art with themes shared by qin melodies can bring similar inspiration. If no indication is given (usually by a link) of the current location of the original of an image on this site, then it is probably in my personal collection. Added 2007. Not yet developed: suggestions welcomed. There are numerous examples of these on other websites. In the past I have had some links here to them, but they keep changing. Some of the examples of these on this website reveal close associations between a painting and a melody. 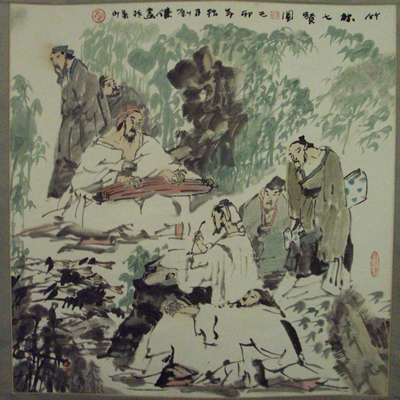 The spirit behind this is an aim to evoke the sort of reaction an artist might have had on hearing the qin at a gathering such as the one depicted on the page The Four Arts of the Chinese Scholar: someone would recite a poem and this would inspire a qin melody; someone would play a qin melody and this would inspire a painting. A personal experience that might be connected to this concept is presented in connection with Silk Zither Dreams.